It’s farewell to footman Jimmy (Ed Speleers) in this Sunday’s second episode of Downton Abbey series five (ITV, 9pm). 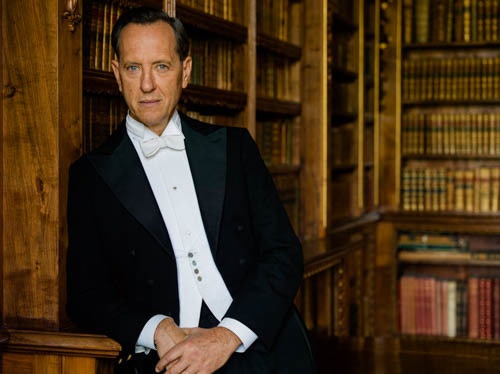 And hello to Richard E. Grant as art expert Simon Bricker. I’ve now seen the first four episodes of the new series with plenty for Downton fans to look forward to in the weeks ahead. Including Lady Mary’s (Michelle Dockery) trip to Liverpool, the latest developments involving the late Mr Green and a surprising turn of events for Violet (Maggie Smith). Last week Robert (Hugh Bonneville) and Cora (Elizabeth McGovern) celebrated their 34th wedding anniversary. But as you may already have guessed from the trailers, Mr Bricker also has an expert eye for a beautiful Countess. 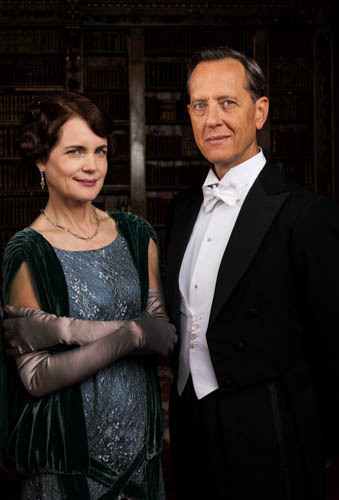 It’s good to see Julian Fellowes writing more for Cora, with Elizabeth McGovern’s talents often under-employed. As regular readers will know, I have covered Downton Abbey since the very start, interviewing the cast ahead of each series. Which this year involved a total of 17 cast members back in August. Some of those 20,000 words of interviews have already been used by national newspapers or are being held for future use. So I am currently restricted as to what I can publish in my TV blog. 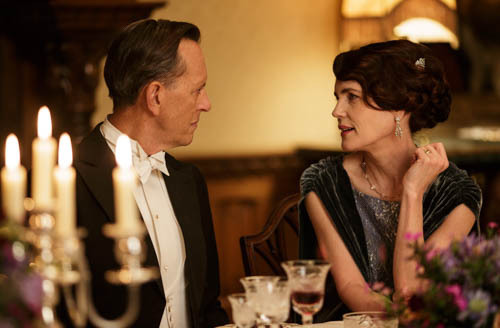 But here are some edited highlights from round table chats with both Elizabeth McGovern and Hugh Bonneville. With only mild spoilers as to what’s ahead. Q: It’s good to explore Lord and Lady Grantham’s marriage? “Oh it is. I wish we did that all the time. That would be my perfect show. We do a little of it. There is a sort of rockiness to the marriage, which I don’t think is untypical of any long term marriage. “It was fun for me to play because not only is it exploring a long term marriage, slightly, but it’s also seeing another side to Cora’s character, which I really appreciated having the chance to play. Q: Cora has a more modern outlook compared to Robert? Q: Art expert Simon Bricker? Q: You’ve been an American living in London for quite some time now? “I’ve been here 21 years. And I actually haven’t even gone back to America all of that much in that time. But I, funnily enough, still feel very strongly connected to my identity as an American. I think that’s partly why I love doing this music that I do because it is very American in sound. And I think it’s sort of comforting to me. Q: Your band – Sadie And The Hotheads v acting? Q: Downton’s huge success in America? Q: Aside from Cora and Robert, there are examinations of love in this fifth series? 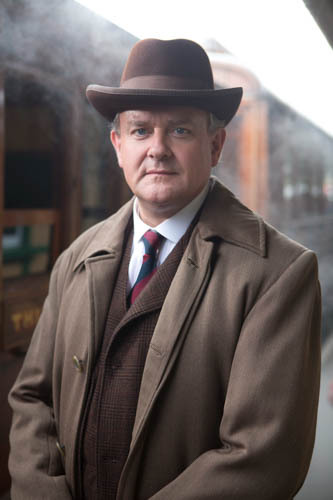 Q: Working with Hugh Bonneville? Q: The arrival of Richard E. Grant as art expert Simon Bricker? “The days of people asking if they can take your picture have gone, unfortunately. And that’s a sadness. I think everyone thinks they have the right for a selfie, whether you want to do it or not. Q: Robert’s relationship with his daughters? Q: The War Memorial story – Robert giving way to Mr Carson. Q: The storyline about Russian refugees starting from episode three? Q: Working on The Monuments Men film. Were other cast already fans of Downton? Q: Do you watch Downton at home? Q: A second series of W1A? Posted in Downton Abbey, News and tagged Carnival Films, Downton Abbey, Elizabeth McGovern, Hugh Bonneville, ITV Drama, Julian Fellowes, Lady Grantham. ITV, Lord Grantham. Bookmark the permalink.